Want to turn that part of your yard where nothing will grow into something more than an eye sore? Consider building a rock garden. You can use rocks and plants that can withstand growing in difficult conditions to transform hard to manage parts of your home landscape. Clear the area. You’ll want to dig up the soil where you’re creating your rock garden and get rid of any grasses, weeds, trees, and roots. Add rocks and soil. 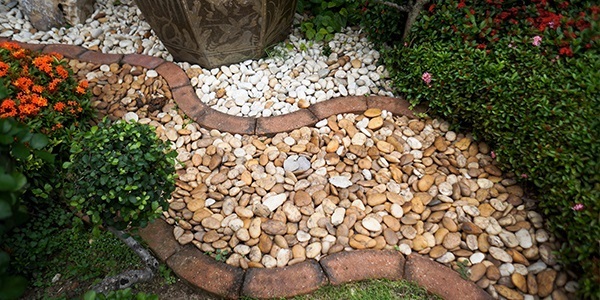 Select the rocks you want to use for your garden and begin placing them. It’s a good idea to choose rocks of different sizes and shapes. Variety is desirable and will create a more natural look for the garden. If you’re planning on adding a lot of plants, your rocks should be placed farther apart. The soil that you use in your rock garden should drain well. You may be able to use the dirt that’s already in your yard or you may need to supplement it with something that’s less clayey. Select plants and flowers. The local nursery can help you select the best plants for your garden. Typically, vegetation that does well in rock gardens will not grow much taller than 1 meter and prefers well drained soil. Again—variety can be the key here, both in color and when the plants will bloom in the year. Whatever you decide, you should have fun with your choices!